Geo-political experts, in and out of academia, have been very busy in the last 15 years or so, in attempting to fathom what makes Vladimir Putin’s mind tick. They know that Putin spent 16 years as a KGB agent and that his natural propensity, when it comes to geo-political strategic thinking, is to plan three or four or five moves ahead of any opponent using propaganda and disinformation to provide cover and rationale for his actions. In general the Russians have become quite proficient at this. Putin for one has been spinning a web around the US and other intelligence agencies for more than a decade now. For him it’s like a chess game. He usually comes out on top and is quite proud of his strategic cleverness. Alas, it may prove to be cleverness by half in the final tally, but we’ll get to that later. For the movement I’d like to explore in some depth the roots of the idea of Russian exceptionalism, in order to better understand Putin’s mind. To relegate ideas on Russian exceptionalism merely to the realm of the historical and political science is to miss their real import for the present global reality. In the first place it must be grasped that when a Putin claims exceptionalism, it has precious little to do with exceptional in the concern for justice and human suffering. It has more to do with a claim to inherent superiority resembling what today goes by the name of Western White Supremacy as promoted by a Steve Bannon in the White House. 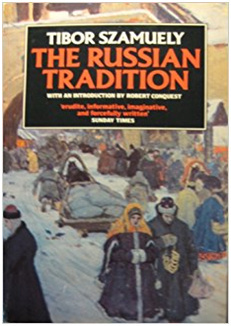 If one reviews Russian history in the 19th and 20th century, it soon becomes apparent that Russia, whether under the tsars or under communism, has always insisted that somehow it had a right to remake the world because of the monopoly on truth contained in its ruling doctrine. This may no longer apply in the era of post-truth when Russia no longer has an ideology, but Russia continues to glorify its past and assert what it considers its rights, sometimes at the expense of the rights of others, unfortunately. But let’s stay with the 19th and 20th century. What gave the Russian state a quasi-divine status, in some way comparable to Western feudal times when the King was divinely appointed? Could it explain the absence of the rule of law in Russia? How deep are the roots of this idea? As everybody knows, the dominant religion in Russia is Orthodox Christianity which came to Russia from Greek Byzantium, the continuation of the Roman Empire in the East. Byzantium fell in 1453 to the Ottoman Turks and so Russia was left as the only Othodox state. The Russians naturally began to see themselves as under siege from the infidels at its edge. The state became the protector of what they surmised to be the only true form of Christianity, therefore it was semi-divine. Soon, the notion of Moscow as “The Third Rome” arose The first one fell in the fifth century AD in the West, the second fell in the 15th century AD in the East. The third one, obviously would last at a minimum another 1000 years; in fact, forever. This is indeed a head-spinning theory easily spun into a fanatical belief and article of faith. One problem is that the first and second Rome are not exactly dead, yet. They reside in the Vatican and they seem to be alive and well. The first Rome in some way was revived via the Italian Renaissance which was a synthesis of antiquity and Christianity. Be that as it may, in Russia, the church and the state were not kept separate but equal, rather, unlike medieval Europe, the state reduced the Church to a department of the state bureaucracy. The Tzar in effect became the political and spiritual ruler in one person, albeit with a messianic, as well as temporal mission. Dante had pointed out that the usurpation by the Popes of temporal power in medieval times, was the original sin of Christianity in Europe and it did not begin with Charlemagne as emperor of the Holy Roman Empire but with Constantine as head of the empire and equal partner with the church in determining Christian orthodoxy. Under the Communists, however, the new god was the Socialist ideology. The messianic spiritual doctrine that had conferred a sense of human worth to the individual (even Marx acknowledges that much when he surveys European feudalism) was rejected and removed. Now the Russian Communist rulers (whom Putin served faithfully as a KGB agent) could and did eliminate millions in the pursuit of their Utopian socialist goals. In 1989, with the collapse of the Soviet Union, Russia was bereft of a national ideology. All it seemed to have been left with, was an unsteady democracy and a collapsing economy. Putin came to power after Yeltsin, in the 21st century. He began promoting the revival of a humiliated Russia, the idea of a strong state regardless of ideology. Autocracy became all-encompassing. Stalin himself, the ultimate Machiavellian autocrat, was praised at one point. The idea was that the purpose of Russian history is the creation of a strong state, even when there are no viable ideas to justify it. Power is an end in itself. Whatever its fault the Soviet interlude was a fundamental part of the Russian state tradition. This is indeed the perfect justification for any corrupt regime looking for popular support. What is ironic in all of this is that now Putin goes around saying that “it is extremely dangerous to encourage people to see themselves as exceptional” and by that he means American exceptionalism, and yet paradoxically he fails to see that if that standard is applied to Russia it would cast doubt on the validity and value of the entire Russian tradition as narrated by Tibor Sazmuely, not to speak of Putin’s interpretation of the purpose of Russian history as the creation of a strong state wherein the state is the master and not the servant of society. For indeed a state which acts in defense of the innocents and of human values never makes such claims. 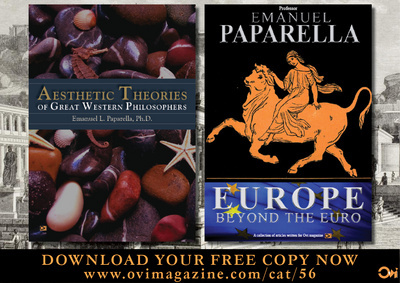 So, there is exceptionalism and there is exceptionalism, and we must be careful in distinguishing the two. So much for the historical overview. However, to get to the ultimate source of what is considered the Russian national greatness, we must examine in some depth Russian Literature, specifically that of Dostoevsky and Tolstoy in the 19th century. They are both steeped in Russian tradition; they were both great patriots, but their approach to such greatness is significantly different. Dostoevsky believed that Russia’s special mission in the world was to create a pan-Slavic Christian empire with Russia as its leader. Why did he believe that? Not so much because of geo-political considerations, but because he was convinced, and this come through in all his great novels, that Russia was the most spiritually developed of all nations, thanks to its Christian Orthodoxy. That kind of thinking may at first appear to be triumphalist thinking, almost White supremacist, albeit he never conceived of Christian Orthodoxy as a White monopoly; it was universal. Without the adjective “Christian” it could in fact be so interpreted. Without the mitigation of a universal Christian the temptation to fall into an extreme ideological nationalism (on the right or on the left) is ever present. Tolstoy, on the other hand, believes in the universality, not only of the Orthodox Church, but of the human experience as such. He is multicultural in the sense that, while loving Russia and its heritage, also believes in the uniqueness and inherent genius and dignity of all cultures; that every nation has its own unique traditions which need to be respected, not to speak of universal rights and obligations. War and Peace is a prime example of Tolstoy’s consummate ability to get to the truth of each one of his characters, never mind their ethnicity, race or nationality. It’s always the universal humanity that is emphasized, never the particular nationality. In contrasting those the approach of Dostoevsky to that of Tolstoy, we begin to understand the utilitarian manipulation of religion of a Putin for his own geo-political propagandistic goals, for it is not apparent that he has some kind of conversion experience when in 2001 he assumed the helm of the Russian nation. Putin says that he loves Russian literature in its totality and he demonstrated that at the Olympics where at the opening ceremony both Dostoevsky and Tolstoy were prominently mentioned and celebrated. But in reality he prefers the more messianic pan-slavic exceptionalism of Dostoevsky misinterpreted as extreme nationalism, to Tolstoy’s humanistic democratic universality. In describing the fall of the Soviet Union the greatest geopolitical catastrophe of the 20th century and a “genuine tragedy” for the Russian people, the former KGB agent finds Dostoevsky much more malleable to his nationalistic propaganda, devoid of ideology, than a Tolstoy’s objective insistence on the universality of human rights. 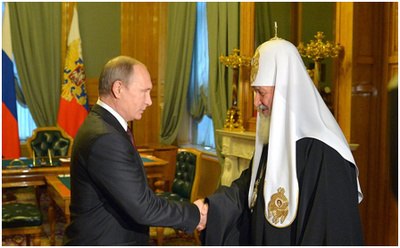 The only universality discernible in Putin’s doctrine is that of the Russian Orthodox Church, but if one looks close one realized that it hardly goes beyond the borders of eastern part of Western Civilization. After all, the second Rome, that of the Vatican, is still alive and well. It too claims catholicity. And besides, even the original Greek orthodox faith is back in Greece and it claims primacy over Russian Orthodoxy. So what is really going on, beyond the messianic claims of Dostoevsky, is an anxious search for a sense of national worthiness among the family of nations. The problem is that it usually comes with a tinge of superiority parading as Russian exceptionalism. Putin frequently quotes Dostoevsky, Lovyev, Berdyaev, Ilyin. Tolstoy is mentioned at times but much less frequently. Tolstoy’s approach seems to ill-suit Putin nationalistic, slightly paranoid propaganda. How else to explain the annexation of Crimea and the saber-rattling on the Ukrainian border? They are more reminiscent of Napoleon or Hitler’s invasions of Russia than of the Third Rome usually used as a cover for Machiavellian geo-political strategies. What Putin and his supporters have utterly failed to understand is Tolstoy’s insight, quite obvious in War and Peace, that within a genuinely Christian vision true strength comes from humility, not from arrogance, bellicosity, love of power and hubris. What War and Peace teaches is that Russia’s greatness derives not from its pugnacious bellicosity but from the ability of its people to keep their dignity and a moral compass in the face of aggression and hard times. That insight exists in Dostoevsky as well as Tolstoy’s novels and it exists not because of a Machiavellian nationalistic ideological vision parading as patriotism, but because in the Christian scheme of things to achieve peace is to work for justice. That message is the same in both Dostoevsky and Tolstoy’s literature albeit it may be a bit more complicated and hard to discern in Dostoevsky. It is surely embodied in the characters of War and Peace such as the unnamed Russian soldier helping a shopkeeper protect his store from looters, or the teenage girl who leaves behind her possessions to make room for wounded soldiers, or the servant who generously gives 25 rubles to a stranger who shows up at the doorstep of the house she serves, or the Russian Commander in Chief Kutuzov, who shows compassion to enemies, or Count Bezukhov who comes out of his harrowing experiences with Napoleon with a renewed commitment to ideals of compassion. That’s where the emphasis is in Tolstoy, not on that of a country under siege with a sphere of influence at the periphery into which to meddle and create dissensions. One would wish that some of those clergy and monks who now advise Putin spiritually and intellectually would point out to him how misguided his views of Russian exceptionalism are. They imitate Napoleon more than Kutuzov. Tolstoy’s message, on the other hand, is quite clear: just when we think we are winning we may be losing and planting the seeds of our own destruction. Indeed, to use Christianity for one’s own political scheme is ultimately to betray Christianity. Those spiritual advisors to Putin ought to point out to him that it is not a misinterpretation of Dostoevsky’s call to a Messianic exceptionalism, parading as Russian patriotism and call to greatness, that will lead to the retrieving of Russia’s spiritual-cultural identity, but the wiser and more humble alternative path of Tolstoy pointing to ideals and virtues which alone can once again regain for Russia its proud place among the nations of the earth. In War and Peace Tolstoy mirrors the words of the Russian orthodox monk Philotheus who announced the Third Rome in the 15th century: “There is no greatness where there is no goodness, simplicity, and truth.” Let those who have ears, let them hear.